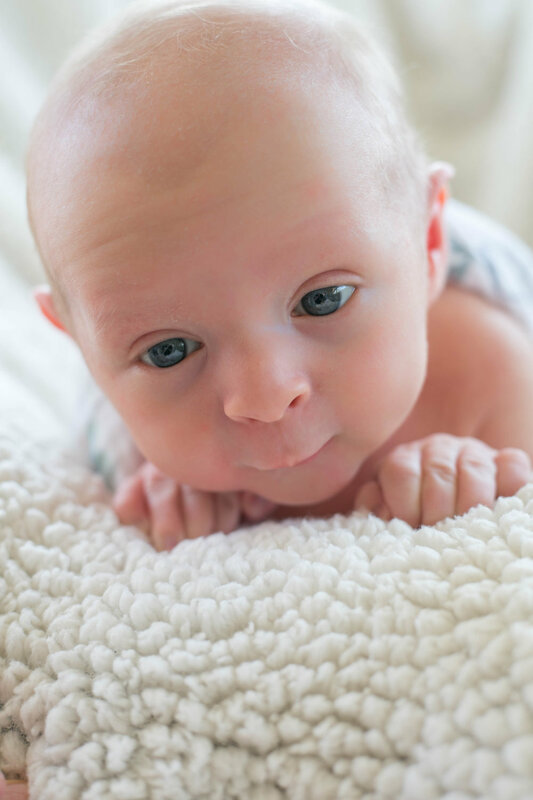 He held his tiny hands up close near his face, his mouth began to open, and as he let out the cutest sneeze I had ever heard, the severity of this new sensation, to him, was quite evident as his entire little frame recoiled in shock. While I thought it was the most adorable thing I had ever seen, he looked at me with huge eyes, confused as to what had just happened to him. 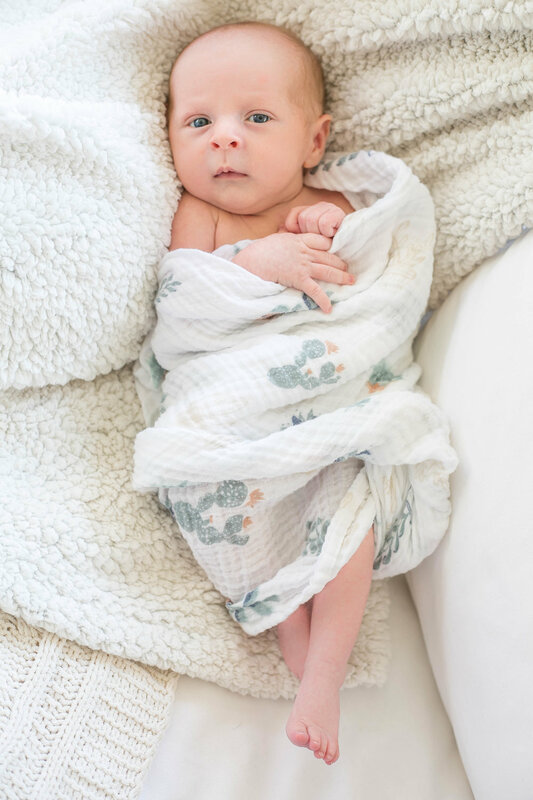 As I held this sweet baby wrapped in his crisp white linen blanket, the perplexed look on his face evened out as his thoughts were quickly forgotten and he faded in to a peaceful sleep. As I sat there, rocking away, I thought about how shocking each new experience must be for baby Carter. I'm sure the feeling of my cold hand running across the side of his tiny face was a bit startling while he was fast asleep, but all of a sudden, eyes closed, bottom lip sucked in, reacting to my touch, he grinned. It was as if he was having a good dream and something had just happened to make his subconscious joy turn on. In that moment, I realized that his brief smile was his way of expressing appreciation for being held. He enjoyed the warmth of my body as he moved in closer turning his head towards my chest hoping I was his food source. I can't explain the significance of how gratifying these moments were to me, but it represented the most pure form of human connection I've ever experienced. They say God is in the details, and just then, I completely understood that God is in fact, in every detail of life, even a sleeping baby's reaction to human touch. It is an overwhelming feeling of joy, being able to see Shannah, my sister, the one I grew up experiencing so many 'first times' with, bring such a sweet baby in to the world with her husband, Clint. Reality set in that I was an aunt of the most amazingly sweet baby boy I had ever laid my eyes on, Carter Rhodes Oncken. 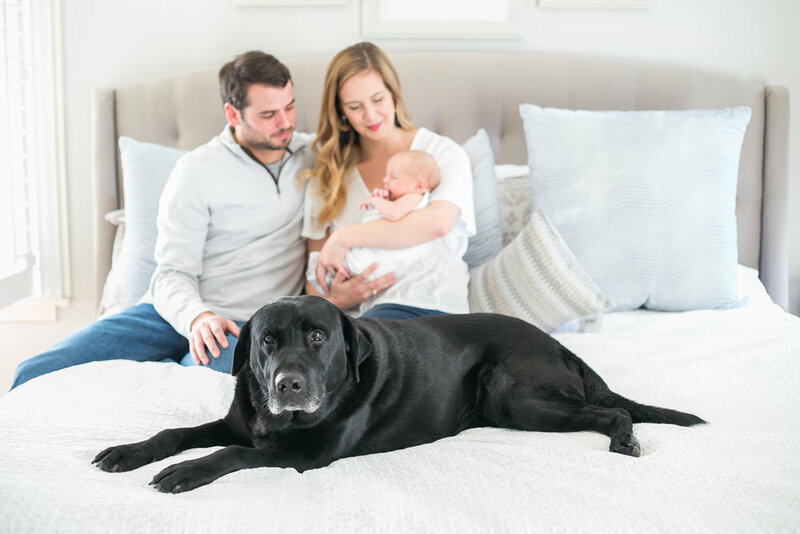 One of the most rewarding things about Carter is his very name in and of itself and the meaning behind why Shannah & Clint were certain it was perfect for their first born son. Let me explain. Rewind almost 6 years ago to when Clint proposed to my sister, Shannah. They were so thrilled to tell both sides of the family and eventually asked if I could photograph their Engagement session. Now, at this time, I was in college studying Photography and was learning the more intermediate fundamentals of photography. I was just starting my journey of learning who I was as a photographer and developing and fine tuning 'my style' of work (R.I.P. heavy editing & vignette). I'll admit, I felt a bit undeserving of the position to fulfill a 'professional Engagement Session', but was so thrilled she wanted me to capture this special time in their lives and was determined to do my best with the knowledge and gear that I had at that time in my photography journey. Their request came with one specific wish. They wanted their photos to be taken on Clint's grandfather's farm in Lufkin, Texas. For me, it was about a four hour drive and I figured if they asked me to come all the way out to East Texas for their Engagement session, that specific location must mean a lot to them. So, sure enough, I packed up my puppy at the time and brought along my new boyfried, Zach, and headed that way. As we arrived late in the night, the smell of fresh pine trees filled our noses and as we exhaled the crisp, clean air, we looked up to enjoy the black sky that was wonderfully lit with the light of only the stars. It was mesmerizing to say the least. We went to bed in the most quaint and charming home at the end of the long dirt driveway. As the sun came up the next morning, my alarm was set & our session began early that morning. Well in to the day, while the sun was high in the sky, Zach and I had the pleasure of meeting Papa as he came to visit us all for lunch at the house and tell us a little bit more about the land. Papa asked if we wanted a tour of the property and after gladly accepting, he said "Well, hop in the back of the truck & let's go!" As he gave us the tour of his farm, also known as 'Blackjack Farm', he explained that the land was a pine tree farm that he had kept up with for many many years. He explained that patience was the key to maintaining his farm because it could take up to 10-20 years for a full crop to grow. He explained, after the crop was full grown, he would have it cleared and begin the process of seeding and planting a brand new crop all over again to start the new and patient process. As the day went on, his character began to unfold with each new story about his wife, whom he loved dearly, but explained with a smile on his face, was up in heaven smiling back down at him. With each new joke he told, his pure heart had all of us smiling from ear to ear with joy in his presence. His goodness shined through with each kind gesture he extended to Zach & I during our visit to Blackjack Farm. He even let us ride on the lawnmower, which we had way too much fun with and will always be a fond memory that we cherish. As evening came, we gave him a huge hug and repeatedly thanked him for his hospitality and kindness. He humbly explained he was happy to have us visit and happy to tell his story. As Zach and I began our drive back home, I wholeheartedly understood why Shannah & Clint had requested their Engagement photos be taken specifically at Papa's farm. Even though I only met him once, I knew that Papa had a heart of gold and contagious goodness that rubbed off on anyone that would spend time with him. God had blessed Papa with many good things that he could be proud of, especially his grandson, Clint. Unfortunately, before Shannah & Clint became pregnant with baby Carter, Papa passed away to see the Lord. He will always be remembered for his humble nature, his diligent hard work and his patience. The smell of pine trees will always remind me of that time we enjoyed with Papa on his farm with Shannah & Clint. Papa's name was Barham Dale Rhodes. 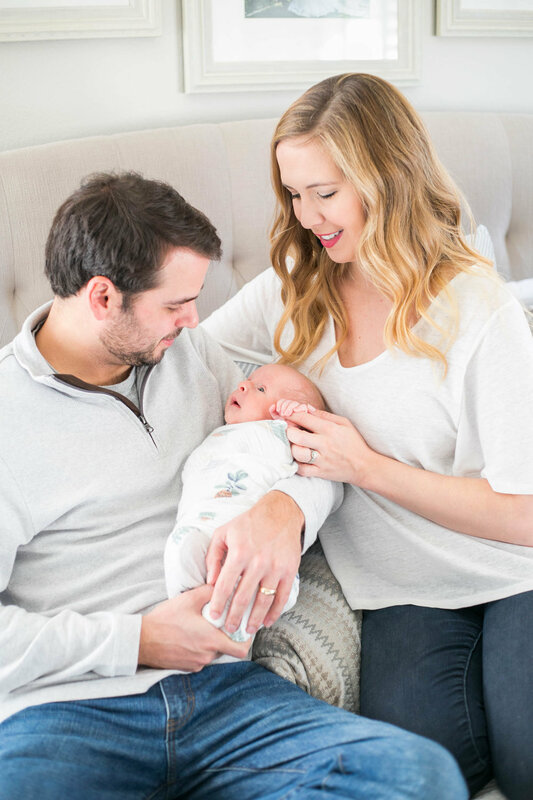 In a way, Shannah & Clint wanted Papa's legacy to continue, and what better way to carry this down the family tree than to name their first born son Carter Rhodes Oncken. Carter was born on November 2, 2017 to the most deserving parents there are. Papa would be proud & I just know he is looking down smiling on sweet baby Carter. I wish you both the very best as you embark on this very big 'first time' in your lives with Carter. I have seen the authentic love between you two & I am grateful for you each being a part of my life. Shannah, you seem like you were made for this moment and that you have understood motherhood as second nature. Clint, I can see your love and patience with your family and am so glad God brought you and my sister together. I can't wait to be there to see all of the 'first times' in Carter's life and am anxious to see the Godly character I saw in Papa in Carter as he grows and learns. Thank you for making Zach & I such a proud Aunt and Uncle and we can't wait to make more fun memories together! Cheers to living our legacy! Ps. I'm glad Waco is loving his new baby brother!